First version of the Ariane launch vehicle. AKA: L3S. Status: Retired 1986. First Launch: 1979-12-24. Last Launch: 1986-02-22. Number: 11 . Payload: 1,400 kg (3,000 lb). Thrust: 2,446.50 kN (549,995 lbf). Gross mass: 207,200 kg (456,700 lb). Height: 50.00 m (164.00 ft). Diameter: 3.80 m (12.40 ft). Apogee: 40,000 km (24,000 mi). 3 stage vehicle consisting of 1 x Ariane L144 + 1 x Ariane L33 + 1 x Ariane H8. LEO Payload: 1,400 kg (3,000 lb). Payload: 1,850 kg (4,070 lb) to a GTO, 7 deg. Launch Price $: 32.000 million in 1985 dollars. Stage 1. 1 x Ariane 1-1. Gross Mass: 160,030 kg (352,800 lb). Empty Mass: 13,750 kg (30,310 lb). Thrust (vac): 2,771.940 kN (623,157 lbf). Isp: 281 sec. Burn time: 145 sec. Isp(sl): 248 sec. Diameter: 3.80 m (12.40 ft). Span: 8.30 m (27.20 ft). Length: 18.40 m (60.30 ft). Propellants: N2O4/UDMH. No Engines: 4. Engine: Viking 2. Other designations: L-140. Status: Out of Production. Stage 2. 1 x Ariane 1-2. Gross Mass: 37,130 kg (81,850 lb). Empty Mass: 3,625 kg (7,991 lb). Thrust (vac): 720.965 kN (162,079 lbf). Isp: 296 sec. Burn time: 132 sec. Isp(sl): 200 sec. Diameter: 2.60 m (8.50 ft). Span: 2.60 m (8.50 ft). Length: 11.50 m (37.70 ft). Propellants: N2O4/UDMH. No Engines: 1. Engine: Viking 4. Other designations: L-33. Status: In Production. Stage 3. 1 x Ariane 1-3. Gross Mass: 9,687 kg (21,356 lb). Empty Mass: 1,457 kg (3,212 lb). Thrust (vac): 61.674 kN (13,865 lbf). Isp: 443 sec. Burn time: 563 sec. Diameter: 2.66 m (8.72 ft). Span: 2.66 m (8.72 ft). Length: 10.23 m (33.56 ft). Propellants: Lox/LH2. No Engines: 1. Engine: HM7-A. Other designations: H- 8. Status: Out of Production. Stage 4. 1 x Mage 1. Gross Mass: 369 kg (813 lb). Empty Mass: 34 kg (74 lb). Thrust (vac): 19.397 kN (4,361 lbf). Isp: 295 sec. Burn time: 50 sec. Isp(sl): 220 sec. Diameter: 0.77 m (2.52 ft). Span: 0.77 m (2.52 ft). Length: 1.13 m (3.70 ft). Propellants: Solid. No Engines: 1. Engine: Mage 1. Status: Out of Production. Family: orbital launch vehicle. Country: France. Engines: HM7-A, Viking 2, Viking 4. Spacecraft: Oscar, Sirio, ECS/OTS, Meteosat, CAT, Firewheel, Intelsat 5, Insat 1, AS 3000, Giotto, SPOT-1-2-3, Viking (Sweden). Projects: Eutelsat, GTE, Insat, Intelsat, MARECS, SPOT. Launch Sites: Kourou, Kourou ELA1. Stages: Ariane 1-1, Ariane 1-2, Ariane 1-3 H8, Mage 1. Agency: Les Mureaux. 1973 July - . LV Family: Ariane. Launch Vehicle: Ariane 1. 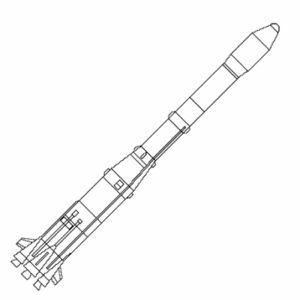 Development of Ariane 1 launch vehicle authorised. - . Nation: France. Development took eight years, and cost 2 billion 1986 ECU's..
1979 December 24 - . 17:14 GMT - . Launch Site: Kourou. Launch Complex: Kourou ELA1. LV Family: Ariane. Launch Vehicle: Ariane 1. CAT 1 - . Payload: CAT 01. Mass: 1,602 kg (3,531 lb). Nation: Europe. Agency: ESA. Class: Technology. Type: Navigation technology satellite. Spacecraft: CAT. Decay Date: 1982-11-14 . USAF Sat Cat: 11645 . COSPAR: 1979-104A. Apogee: 14,047 km (8,728 mi). Perigee: 125 km (77 mi). Inclination: 17.80 deg. Period: 259.10 min. Launch vehicle test. Technological Capsule (CAT). ESA registration number: ESA/79/2. Principal mission of the technological capsule (with ballast), which was equipped with batteries having a lifetime of approximately 8 orbits, was to transmit back to earth technological data on the first developmental flight L01 of the ARIANE launch vehicle. When the batteries were exhausted, the capsule ended its radio transmissions, and it is now inoperative but still in orbit. CAT - . Payload: CAT. Nation: Europe. Agency: ESA. Spacecraft: CAT. Amsat Phase 3A - . Payload: Amsat Phase 3A. Nation: USA. Agency: ESA. Program: Oscar. Spacecraft: Oscar. The satellite never obtained orbit. Weight 92.2 kg. Mode B (435 MHz uplink and 145 MHz downlink) transponder and 145 MHz beacon. VHF and UHF helix wide beam antenna..
CAT 3 - . Nation: Europe. Agency: ESA. Class: Technology. Type: Navigation technology satellite. Spacecraft: CAT. USAF Sat Cat: 12546 . COSPAR: 1981-057C. Apogee: 26,528 km (16,483 mi). Perigee: 261 km (162 mi). Inclination: 10.70 deg. Period: 461.20 min. Launch vehicle test payload. Technological capsule. ESA registration ESA/81/02. Launch time 1233:03 UT. The technological capsule, equipped with batteries for a lifetime of about six orbital revolutions, transmits to earth technological data about test flight L-03 of ARIANE. After di scharge of the battery the capsule will stop its transmissions and remain in orbit on inactive status. Frequency 136-138 MHz (transmission until 65h after launch only). Projected time of reentry 1986. 1981 December 20 - . Launch Site: Kourou. Launch Complex: Kourou ELA1. LV Family: Ariane. Launch Vehicle: Ariane 1. Tech. capsule - . Payload: CAT/Thesee. Nation: Europe. Agency: ESA. Class: Technology. Type: Navigation technology satellite. Spacecraft: CAT. Decay Date: 1988-11-21 . USAF Sat Cat: 13025 . COSPAR: 1981-122C. Apogee: 36,051 km (22,401 mi). Perigee: 199 km (123 mi). Inclination: 10.60 deg. Period: 636.00 min. Ariane L-04 technological capsule, ESA designator ESA/81/04. The technological capsule, equipped with batteries for a lifetime of about 6 orbital revolutions (65h), transmits to earth technological data about test flight L-04 of Ariane. After discharge of the battery the capsule will stop its transmissions and remain in orbit in an inactive status. Frequency 136-138 MHz, projected time of reentry before 1990. MARECS 1 - . Payload: MARECS A. Mass: 582 kg (1,283 lb). Nation: Europe. Agency: ESA. Program: MARECS. Class: Communications. Type: Civilian communications satellite. Spacecraft: ECS/OTS. Completed Operations Date: 1996-08-20 . USAF Sat Cat: 13010 . COSPAR: 1981-122A. Apogee: 37,858 km (23,523 mi). Perigee: 36,782 km (22,855 mi). Inclination: 10.80 deg. Period: 1,515.20 min. CAT 4 - . Payload: MARECS 1 / CAT 4. Mass: 217 kg (478 lb). Nation: Europe. Agency: ESA. Class: Technology. Type: Navigation technology satellite. Spacecraft: CAT. USAF Sat Cat: 13011 . COSPAR: 1981-122B. Apogee: 30,744 km (19,103 mi). Perigee: 259 km (160 mi). Inclination: 10.40 deg. Period: 536.80 min. Launch vehicle test payload. .
1982 September 9 - . 02:12 GMT - . Launch Site: Kourou. Launch Complex: Kourou ELA1. LV Family: Ariane. Launch Vehicle: Ariane 1. FAILURE: Stage 3 turbopump.. Failed Stage: U.
MARECS B - . Payload: MARECS B. Mass: 1,490 kg (3,280 lb). Nation: Europe. Agency: ESA. Program: MARECS. Class: Communications. Type: Civilian communications satellite. Spacecraft: ECS/OTS. Decay Date: 1982-09-10 . Marecs B intended for maritime communications, planned for lease to Inmarsat; launched with Sirio 2. Geosynch orbit..
Sirio 2 - . Payload: Sirio 2. Mass: 220 kg (480 lb). Nation: Europe. Agency: ESA. Program: MARECS. Spacecraft: SIRIO. 1983 June 16 - . 11:59 GMT - . Launch Site: Kourou. Launch Complex: Kourou ELA1. LV Family: Ariane. Launch Vehicle: Ariane 1. Eutelsat 1 - . Payload: ECS 1. Mass: 1,050 kg (2,310 lb). Nation: Europe. Agency: Eutelsat. Program: Eutelsat. Class: Communications. Type: Civilian communications satellite. Spacecraft: ECS/OTS. Completed Operations Date: 1996-12-11 . USAF Sat Cat: 14128 . COSPAR: 1983-058A. Apogee: 36,246 km (22,522 mi). Perigee: 36,123 km (22,445 mi). Inclination: 9.20 deg. Period: 1,456.50 min. Designator ESA/83/4. Launch time 1159 GMT. Launch agency ESA. Geostationary position 10+/- 0.1 deg E. EUTELSAT 1 is a regional geostationary telecommunication Satellite for European countries. It is operated by the EUTELSAT organization. Frequency plan: 1 36-138 MHz (S-E). 148-149.9 MHz (E-S). 10.7-11.7 GHz (S-E). 14-14.5 GHz (E-S). Positions: Document Positioned in geosynchronous orbit at 10 deg E in 1983; 13 deg E in 1983-1989; 16 deg E in 1989-1991; 25 deg E in 1992-1993; 48E1993-1996; 36 deg E in 1996 As of 31 August 2001 located at 12.27 deg W drifting at 5.043 deg W per day. As of 2007 Mar 9 located at 109.78W drifting at 5.059W degrees per day. Oscar 10 - . Payload: Phase 3B. Mass: 70 kg (154 lb). Nation: Germany. Agency: AmSat. Program: Oscar. Class: Communications. Type: Amateur radio communications satellite. Spacecraft: Oscar. USAF Sat Cat: 14129 . COSPAR: 1983-058B. Apogee: 35,442 km (22,022 mi). Perigee: 4,007 km (2,489 mi). Inclination: 27.20 deg. Period: 699.50 min. AMSAT Oscar 10, registration no D-R 001. Scientific and communication satellite for the amateur radio service. Frequency plan: Transponder U: 435.1 MHz (uplink), 145.9 MHz (downlink), Bandwidth +/- 75 kHz. Transponder L: 1269.45 MHz (uplink), 436.55 MHz ( downlink), bandwidth +/- 400 kHz. Two beacons adjacent to passband. Launch vehicle Ariane L6. First amateur satellite with onboard propulsion (which did not function entirely correctly, due to collision with launch vehicle after separation - hence the not-quite-Molniya-orbit). Computer control failed December 1986 due to radiation damage to memory. As a result, ground control stations have no control over the spacecraft. However, when the orientation is favourable (with respect to the Earth and Sun), OSCAR 10 continues to provide good Mode B service. If users coorperate, OSCAR 10 may provide many more years of service. Project Management: AMSAT-NA (Jan King, W3GEY) and AMSAT-DL (Karl Meinzer, DJ4ZC). Spacecraft sub-systems: Contributed by groups in Canada, Hungary, Japan, United States and West Germany. Spacecraft: Spin Stabilised with Magnetorquers: Power: 50 W solar array, 2 NiCd batteries. Payload: Transponders/Beacons: Mode B: Type: Linear, inverting, 50W; General Beacon: 145.809 MHz (Carrier); Engineering Beacon: 145.987 MHz; Uplink: 435.030-435.180 MHz; Downlink: 145.975-145.825 MHz. Mode L (no longer operational): Type: Linear, inverting, 50W: Beacons: 436.020, 436.040 MHz; Uplink 1269.450 MHz (800 kHz); Downlink 436.550 MHz. 1983 October 19 - . 00:45 GMT - . Launch Site: Kourou. Launch Complex: Kourou ELA1. LV Family: Ariane. Launch Vehicle: Ariane 1. Intelsat 5 F-7 - . Mass: 1,928 kg (4,250 lb). Nation: International. Agency: INTELSAT. Program: Intelsat. Class: Communications. Type: Civilian communications satellite. Spacecraft: Intelsat 5. Completed Operations Date: 1996-07-23 . USAF Sat Cat: 14421 . COSPAR: 1983-105A. Apogee: 35,972 km (22,351 mi). Perigee: 35,928 km (22,324 mi). Inclination: 8.50 deg. Period: 1,444.50 min. Ariane third stage. Launched by European Space Agency. Launch time 0045:36 GMT. Launched spacecraft Intelsat V F7. Positioned in geosynchronous orbit at 60 deg E in 1984-1985; 66 deg E in 1985-1991; 57 deg E in 1991-1995; 47 deg E in 1995-1996 As of 28 August 2001 located at 140.34 deg E drifting at 2.062 deg W per day. As of 2007 Mar 9 located at 88.83W drifting at 2.097W degrees per day. 1984 March 5 - . 00:50 GMT - . Launch Site: Kourou. Launch Complex: Kourou ELA1. LV Family: Ariane. Launch Vehicle: Ariane 1. Intelsat 5 F-8 - . Mass: 1,928 kg (4,250 lb). Nation: International. Agency: INTELSAT. Program: Intelsat. Class: Communications. Type: Civilian communications satellite. Spacecraft: Intelsat 5. Completed Operations Date: 1994-12-17 . USAF Sat Cat: 14786 . COSPAR: 1984-023A. Apogee: 36,755 km (22,838 mi). Perigee: 36,531 km (22,699 mi). Inclination: 8.20 deg. Period: 1,480.10 min. Positioned in geosynchronous orbit at 53 deg W in 1984-1985; 180 deg E in 1985-1994 As of 28 August 2001 located at 164.20 deg W drifting at 10.735 deg W per day. As of 2007 Mar 11 located at 110.10E drifting at 10.740W degrees per day..
1984 May 23 - . 01:33 GMT - . Launch Site: Kourou. Launch Complex: Kourou ELA1. LV Family: Ariane. Launch Vehicle: Ariane 1. Spacenet F1 - . Mass: 705 kg (1,554 lb). Nation: USA. Agency: GTE. Manufacturer: Lockheed. Program: GTE. Class: Communications. Type: Civilian communications satellite. Spacecraft: AS 3000. USAF Sat Cat: 14985 . COSPAR: 1984-049A. Apogee: 35,897 km (22,305 mi). Perigee: 35,840 km (22,260 mi). Inclination: 4.90 deg. Period: 1,440.30 min. Stationed at 120 deg W. C, Ku band communications satellite. Positioned in geosynchronous orbit at 120 deg W in 1984-1993; 115 deg E in 1993-on. As of 2 September 2001 located at 165.12 deg E drifting at 0.985 deg W per day. As of 2007 Mar 10 located at 109.23W drifting at 1.077W degrees per day. SPOT 1 - . Payload: Spot 1 / Viking. Mass: 1,830 kg (4,030 lb). Nation: France. Agency: CNES. Program: SPOT. Class: Earth. Type: Earth resources satellite. Spacecraft: SPOT-1-2-3. USAF Sat Cat: 16613 . COSPAR: 1986-019A. Apogee: 826 km (513 mi). Perigee: 824 km (512 mi). Inclination: 98.70 deg. Period: 101.40 min. Remote sensing satellite. Registration 1986-1.B.